When I awoke bleary-eyed at 12:15 am last night, I rolled over to Jeff's side of the bed to discover a still-warm, empty spot. Fearing he was ill, I immediately walked to the bathroom. Empty. I walked into the kitchen and there he was, standing in the darkened room lit only by the bluish glow of the refrigerator light. His cheeks were bulging, and he was holding a big slice of leftover eggplant and caramelized onion pizza. "Noffin," he said, trying unsuccessfully, to hide the ball of pizza stuffed in his mouth. "Doesn't look like nothin'," I said, "Looks like pizza." "You're dreaming. Go back to bed," he said. If ever there was a pizza worth getting up in the middle of the night, it's this eggplant, caramelized onion and prosciutto pizza with smoked mozzarella. I used store bought basic white pizza dough for this recipe. But if you're looking to make your own, here are my recipes for basic white pizza dough and whole wheat pizza dough. 1. Preheat oven broiler. Line a large rimmed baking sheet with aluminum foil for easy clean up. Lay eggplant slices on sheet without overlapping. Brush both sides of slices with 2 teaspoons olive oil. Broil for 7-8 minutes or until browned. Flip over, and broil another 4-5 minutes or until lightly browned. Remove from oven. 2. Position an oven rack in the lowest setting. Place pizza stone on the rack. Preheat oven to 500 F. Heat 2 teaspoons olive oil in a medium skillet over medium heat. Add onions; cook, stirring occasionally for 5 minutes. Once they begin browning, lower the heat and cook until soft and browned all over, about 12-15 minutes. Stir in sherry vinegar and heat 1 minute. 3. Roll out pizza dough on a lightly floured surface. Brush with remaining 1 teaspoon olive oil. Spread with tomato sauce leaving a 1/2-inch border. Top with half of the smoked mozzarella. Arrange eggplant slices, slightly overlapping. Top with sun-dried tomatoes; arrange caramelized onions evenly on top and scatter the olives. Sprinkle with crushed red pepper and remaining smoked mozzarella. Slide pizza onto preheated pizza stone scattered with 1 tablespoon yellow cornmeal. Bake for 8-10 minutes, or until both the top and bottom of the crust is golden brown and the cheese is melted. Place prosciutto slices on the hot pizza. Sprinkle evenly with fresh herbs before serving. Caught red handed! LOL, looks great. This really is a stellar combination of pizza toppings. I would say they're a drunk med student's dream. But this pizza is way above that. I made a pizza that was just carmelized onions with Swiss and Gruyere cheeses. Those onion were cooked down for over 90-minutes into almost a jam. So intense and yummy. This sounds great. Love the sophisticated sound of the flavor pairing on this pizza and will definitely give it a shot. You don't need an excuse to wake up at any hour for that pizza. looks delicious. Yum! This one will be competing at my house with your Philly Steak pizza . . . if not for middle-of-the=night noshing, then for breakfast! Looks great! This pizza definitely sounds like it's good enough to get up in the middle of the night for! Eggplant, prosciutto . . . mmm! Boy, do we miss pizza in our gluten-free house! I have found store-bought gf crusts to be dismal cardboard affairs and have not yet tried to come up with my own. Any thoughts? Agreed...Worth getting up at midnight for sure! You have to make some of this up! That is hilarious. denise-Oh, I adore slow cooked onions. I can imagine how rich yours was! rosemary-You like that Philly Cheesesteak Pizza, huh? Jeff will be happy to hear it! gluttonforlife-I haven't tried making any GF doughs yet. Wish me luck! mia-Nope. It's all true. Scout's honor. Amazing pizza...if there was ever any pizza left over when I made it, I would catch my husband doing the same thing. But then, there's never a wrong time for pizza. Haha! This is hilarious! Gotta love pizza right from the fridge. And that pizza looks so yummy - what a great combo. Sounds just like something I'd nab my hubby doing... but from the sounds of this pizza, I don't think I could blame him! Looks fantastic!! LOL, caught in the act! he must have been dreaming about those pizza! How funny! The pizza looks and sounds so delicious! You are too cute. Love this witty post. And the pizza looks fabulous! Believe it or not, I am not a big pizza fan, at least not the mainstream type sold in 'popular' pizza chains. I do however loooove a good home made pizza with wonderful roasted veggies and gourmet cheese. This pizza sounds like my perfect pizza! Especially with the eggplant and sun dried tomatoes! Bravo! Wow that looks good! 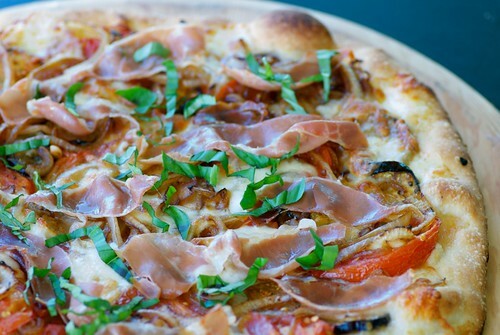 I love proscuitto on pizza. Will try this one next time it's pizza night (which is most Fridays). Haha, I've been caught sneaking into the fridge late at night too :P That pizza looks delicious! Oh my gosh! I love your recipe of midnight pizza. I'm actually a pizza lover so this is really a great info for me. Thanks for sharing your recipe!